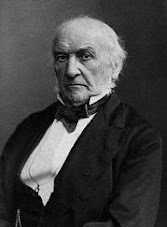 William Ewart Gladstone's commentary on the third Millennium. When one is very elderly one slumbers a great deal. Indeed a simple snooze can last for weeks. Sometimes I stir and have a sense that centuries have passed. Can it be a little more than a year since I hailed the prospect of a new Midlothian? I cannot condemn Mr Clegg for aligning himself, in defeat, with the forces of Toryism. Indeed much that is Liberal is being achieved. Indeed I am all too aware that any government may enjoy the briefest of "bright new dawns" and may fast be riven by division and the power of individual ego, let alone the high expectations of the masses. It does not appear that Mr Clegg has handled himself well in all respects. He would do well to dissociate himself a little more from Mr Cameron. He should be aware that when I coined the maxim to "trust the people" I meant it, well aware that one can transform in a few months from Grand Old Man to Murderer of G. These tides of popular opinion do not last as they are based on little substance. The affair of the newspaper barons appears to have offered Mr Clegg an opportunity he must take to assert himself. Regardless of political adversity, he must appear to be a statesman and must continue to have the interests of the people at his heart, however vilified he may be. His hour is yet to come. Am I excited? By gum, I am flying over the moon. Not since Midlothian, has a Liberal so captured the mood of the nation as has young Mr Clegg. In the space of just two, he has gained many years in wisdom and gained even more in public stature. I would say more but my scribe continues to inform me he is far too busy running around after Mr Clegg to spare time to jot down my ancient ramblings. I would merely remind you of the prediction I made a year ago. If it is not now, it will be soon. 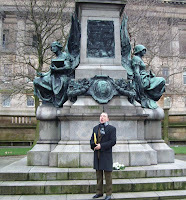 detail from the magnificent statue erected by the good people of Liverpool in my honour. The last time I spoke in public it was to a crowd of some 7,000 in my home city of Liverpool when I took the opportunity to denounce the massacres of the Armenians. Today a gathering a mere one per cent of this size gathered to join me in my 200th birthday celebrations in this great English city - but it was a large and warm enough crowd to cheer the heart of an elderly gentleman. I do wonder that I have become such a person of inconsequence that my successor as Prime Minister or successor as leader of the Liberal Party could not attend. Nevertheless, it is stated that a prophet is not without honour except in his home, and it is gratifying indeed to be honoured in your own home city when you are such an age as I. Within the city's magnificent St George's Hall, a series of lectures was delivered, leading me to the verge of weeping as they recalled the sounds and sights of my childhood in a city on the brink of transition. I am able to share some moving pictures now, thanks to the wonders of telegraph transmission, of the laying of a wreath. Shortly I shall share some further photographs and discuss the very moving and appropriate contribution to the proceedings made by the excellent Mr Steve Binns, who is the city's community historian. The account of the sad,mad gentleman who has been deprived of life by the Chinese authorities for the carrying of substantial amounts of narcotic substances is distressing. Nevertheless it ill befits ministers of Her Majesty's government to treat the matter as of diplomatic importance or as an affront to British pride, or even to British values. For it is barely some 150 years since this nation, most shamefully, went to war with China to enforce the smuggling of drugs into that great country. Her Majesty's ministers are quite entitled to express regret about this present incident, but not dismay, as in the Chinese mind this too readily sounds like a nation that has forgotten the opium trade. We are no longer a nation who goes to war because a pirate loses his ear. China is a great nation with a great past and a momentous future. There are many breaches of the rights of its citizens for which it can be criticised, now and in the recent past. Its justice is harsh but we should not as a nation look foolish by seeking confrontation over the fate of proven criminals. It is now 200 years since the date of my arrival in this world. It's my birthday! Mr Nick Clegg continues to make his admirable argument that it is time for the great Liberal Party to be restored to its place in British politics. His new pamphlet is available here. As for me, I spent the summer months walking in the mist of the Welsh mountains, an entirely pleasant experience. However my scribe declined to accompany me and, indeed, continues to state that he has personal business too pressing for him to make time for the ramblings of an old man. Indeed I suggested a visit to the festival in my honour at Deiniol's at the weekend but the curmudgeon declined, stating it was an entire weekend, rather than a festival of frolicking and merriment such as the good people of Hawarden have enjoyed on other occasions. I believe he was misinformed and that in the course of the summer the Library had reached the decision to allow some public participation so we are both disappointed. To return to Mr Clegg, I am by and large in accordance with his thesis, as I have stated earlier. I am somewhat less certain that now is the time for a resurgence of liberalism. Economic hardship creates fear and petty-mindedness and it is a sign of greatness, not a feature of the common person, that a nation can abide by liberal principles in such times. It is quite possible that the fortunes of politics will ensure that a liberal party continues to exist in a central position in the nation's democracy and will be well-placed to rebuild a liberal and great nation. But now is not the Liberal Hour. I was 200 at the end of 2009 but my words on politics, faith, morality and liberalism continue to outpour. From Heaven Above - A Review of Praying In God's Theater: Meditations on the Book of Revelation by Joel L. Watts.